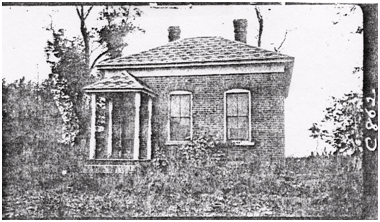 YESTERDAY: Brick single cell house built in the 1893; photo c. 1920, Weber County Assessor. 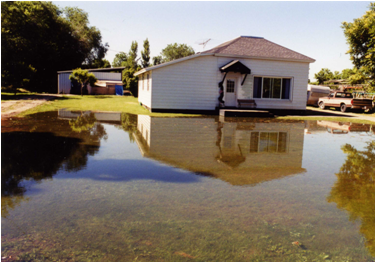 TODAY: Siding and an addition of the left have greatly changed the appearance of the house;irrigation still continues from the old Bingham Fort ditch, now called the Lower Lynne ditch;photo 2001. The main section of this house was built in the 1893; it was one story, brick, single-cell house type displaying the relieving arched window heads of the Victorian Eclectic style (See c. 1920 photo). The single-cell house is an English form that was popular in Utah well into the 1890s. A summer kitchen was located in the rear. Siding now covers the exterior brick walls and an addition has been added to the east side. Walter Crane’s store house pictured below was taken down in 2007; he called it the bishop’s storehouse. Between two support beams was stashed a book of tithing records written in the 1880s and 1890s for the Lynne Ward . William Walter Stannard Crane was born in the county of Norfork, England in 1848. At age 14 he was baptized into the Mormon Church and soon after that was apprenticed to be a miller. In four years his apprenticeship expired, and he returned home to help his father get ready to emigrate; on May 18th 1866, the Crane family began their journey from Liverpool to America. The Crane family journeyed on by steamboat and railroad (railroad was often called “the cars”); they took a steamboat again to Wyoming Territory where Walter wrote, “I saw the first redskin that I had ever beheld and thought it quite a curiosity.” The family continued on in a wagon train, leaving the banks of the Missouri River on July 24th 1866, and starting across the plains. The family had the sad experience of burying a 4 year old son at Muddy Creek Wyoming. Walter went to Farmington, Utah, to work at the flour mill of a Mr. Clark. Most of the employees were converts and emigrants, experiencing their first jobs in the new country. Walter, however, was an experienced miller and became a valued worker. Mary Ann Rackham arrived in America from England in 1868. What she remembered about her journey across America was how large the country seemed and like a wilderness compared to England. The Civil War was just two years over, so she saw first hand the scars of internal war on the first part of the journey. On the second part of the journey the railroad construction followed the wagon train trail part of the time, and her brothers were allowed to leave the wagon train and work for the railroad to earn much needed money. In Salt Lake City Mary Ann lived with her aunt who prepared Mary Ann for the job of housework, teaching her the difference between service in England and that in Utah. With this preparation Mary Ann went to work for a family by the name of Clark in Farmington. She was the maid of all work, watching the children, and cooking and serving the men who worked for Mr. Clark in his flour mill. Walter was 21 and Mary Ann 19 when they were married in the old Endowment House in Salt Lake City in 1869. Their employer, Mr. Clark, opened another mill in Morgan and put Walter in charge of it. During the following 10 years Walter worked as a miller in Morgan and then in Tooele. In 1873 Walter took a second wife, Emma Arnip, who lived in Tooele City, and in 1876 he married a third wife named Lucinda . In the fall of 1879 Walter and Mary and daughter Annie moved to Ogden and bought a small farm in what was then called Bingham’s Fort at Lynne (Ogden), Utah; Walter was now working for the Utah Central Railroad Co. as a brakeman and check master. Walter and Mary Ann first lived in a two room log cabin already on the property left by the David Crowther family. They were delighted with the orchard, currant bushes and a small pond fed by a natural spring. Irrigation water was supplied by the Bingham Fort ditch, now called the Lower Lynne ditch. They planted more trees, bushes and flowers and planned to build a brick house and spend the rest of their lives here. 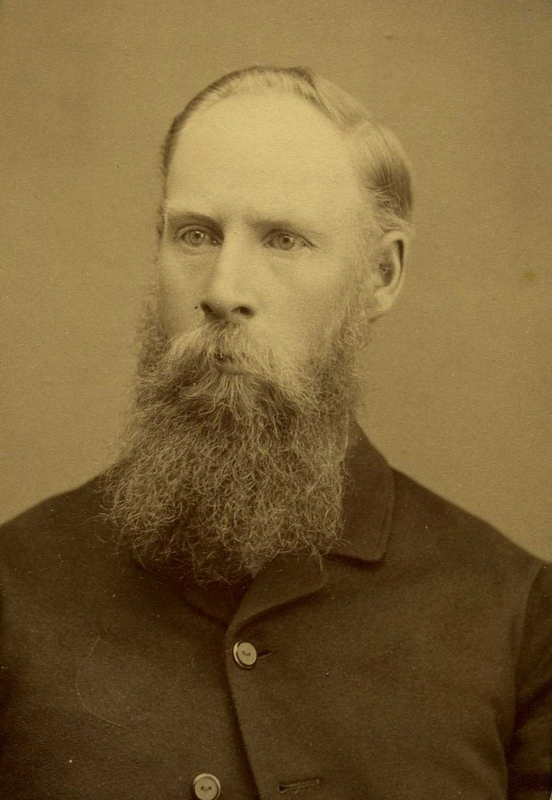 By 1883 Walter had again changed vocations and was listed in the Ogden City Directory as “a contractor and builder”. Mary Ann carried on her tasks of carding wool, spinning and weaving. She milked cows, made butter and cheese, raised chickens and ducks and sold eggs. Apples from their orchard were dried or made into cider or vinegar. The surplus was sold and nothing was wasted, not even the feathers that were saved for feather beds. Walter Crane, photo c. 1900. The frame house west of Walter Crane’s, 125 West 2nd, was built by one of Walter’s granddaughters, Mary Bolander and her husband Clarence Stromberg. The next house, 133 West 2nd, was the frame house of Walter’s daughter, Annie Crane and her husband Anders Bolander. This house at 133 W. 2nd has been in possession of Annie Crane Bolander family for more than 100 years. Photo of Mary Rackham Crane and some family members. 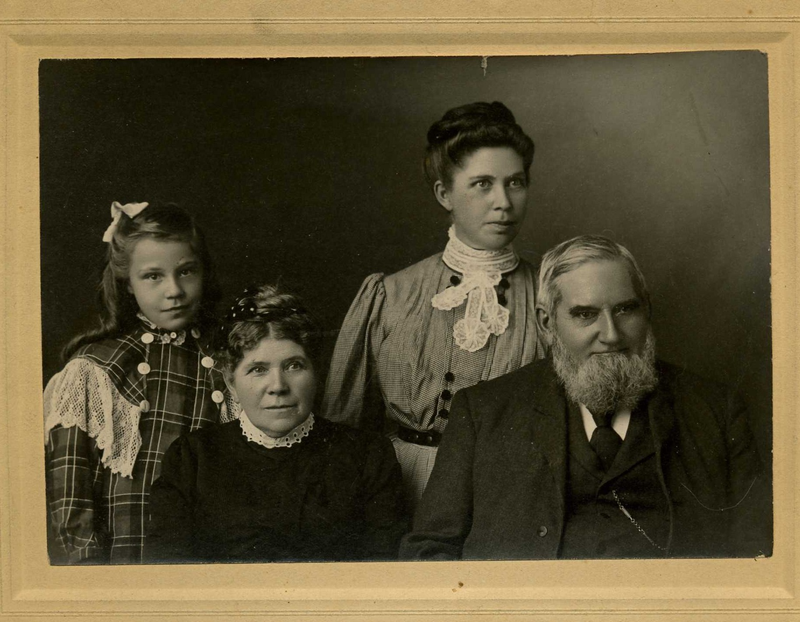 Front: Mary Ann Rackham Crane, her father, Mr. Rackham; Rear: her granddaughter,Mary Bolander (Stromberg) and her daughter Annie Crane Bolander. Photo c. 1910. L to R: Homes of Walter Crane, his grandaughter Mary B. Stromberg, and his daughter Annie Crane Bolander. Thomas Carter and Peter Goss, Utah’s Historic Architecture, 1847-1940, 1988, Utah State Historical Society, p. 11, 12. Tithing book in possession of Brendan James, Ogden, Utah. Mary Bolander Stromberg, Biography of William Walter Stannard Crane, manuscript, p.1-3. Alice Bolander Davison, Mary Ann Rackham Crane, manuscript, p .4, 5. Stromberg, Biography of William Walter Stannard Crane, p. 3; Family Search, pedigree resource file. Alice Bolander Davison, Mary Ann Rackham Crane, manuscript, p. 7. Stromberg, Biography of William Walter Stannard Crane, p.3; Andrew Jensen, History of the Lynne Ward, manuscript, 1893, p. 11, 12. Letter of Evelyn Stromberg Kerr, Tooele, Utah, 23 Sept.1998.